Click on image for a PDF printable version of this page. 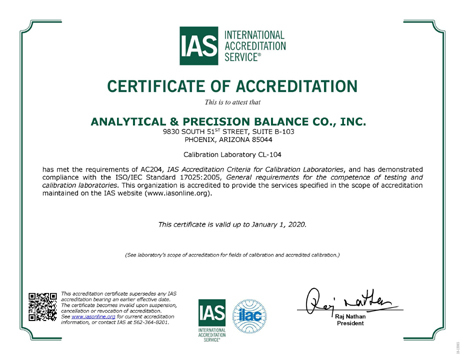 Analytical & Precision Balance Co., Inc. has an ISO-IEC 17025:2005 accreditation through the International Accreditation Service, Inc. (Calibration Laboratory CL-104). Our scope is in the measurement of Mass. The ILAC Arrangement builds confidence among accreditation bodies and their ability to determine a laboratory's competence to perform testing or calibrations. Confidence facilitates the acceptance of testing and calibration results between countries when the results can be demonstrated to come from accredited laboratories. Through the ILAC Arrangement, the foundation for realizing the ideal of having products "tested once and accepted everywhere" has been established. The following is a list of signatories, the scope of their recognition and the date of signing the ILAC Arrangement. If you require the contact details of all the members of ILAC by economy, these are available from the members contact details page. To reference the ILAC Mutual Arrangement document, please click here. 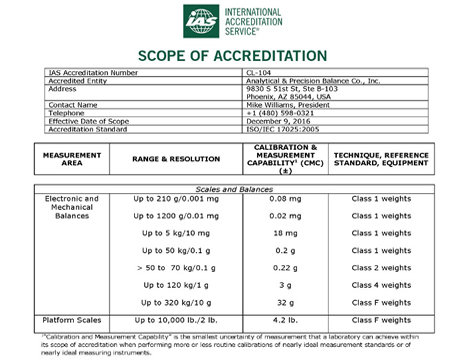 Click here for NIST traceability of our weight standards. For information on the Taranath Code and an explanation of Type A & B uncertainties, please click here. Please click here to read our company's quality policy.